These current projects showcase the collaborative and innovative ways VTS can support a wide range of communities. How can we help with your project? Contact us. The VTS School Program is a school-wide, multi-year professional development program for pre-K, elementary and middle schools. VTS professional development fosters educators' facilitation skills & student-centered practices. Our model includes a combination of full-staff trainings, grade-level or content-area group debriefings, and coaching sessions each year. Educators begin to hone discussion facilitation skills with carefully selected images. Over time, educators transfer skills to a variety of content areas including: science, math & language learning. Students engage with VTS curriculum that is intentional, sequential and developmentally-based to support students growth in critical thinking, language and art-viewing skills over time. In 2015-16, VTS contracted directly with 42 schools, providing training and coaching support to 490 classroom teachers, reaching 12,750 students. What began in 2012 as a collaborative experiment in live, online image discussion has since become the most popular feature on the New York Times Learning Network blog. VTS Moderators respond to student comments with paraphrasing unique to the blog format. Hundreds of comments stream in throughout the 9:00am - 2:00pm (EST) window of live discussion on Mondays, enabling VTS Moderators to focus on framing thinking and common themes between students. Students also respond to one another, making for interesting linkages between ideas from all over the country and world. Following the live discussion, students continue to post comments throughout the week. On Friday mornings, information about the photo is revealed at the bottom of the WGOITP blog. Students are encouraged to consider how reading the caption and learning the backstory might influence the ways in which we see the image. Our team is made up of highly experienced VTS trainers and practitioners working in schools, art museums and cultural institutions. In 2016, the Turnaround Arts program, a project of the President's Committee on Arts and Humanities, selected VTS as one of only two whole-school arts integration strategies to support student engagement, improve instruction, and raise achievement in some of the nation's lowest-performing schools. In the 2016-17 school year, VTS is providing professional development opportunities to over twenty Turnaround Arts schools in New York, Oregon, California, Wisconsin, Minnesota and North Dakota. 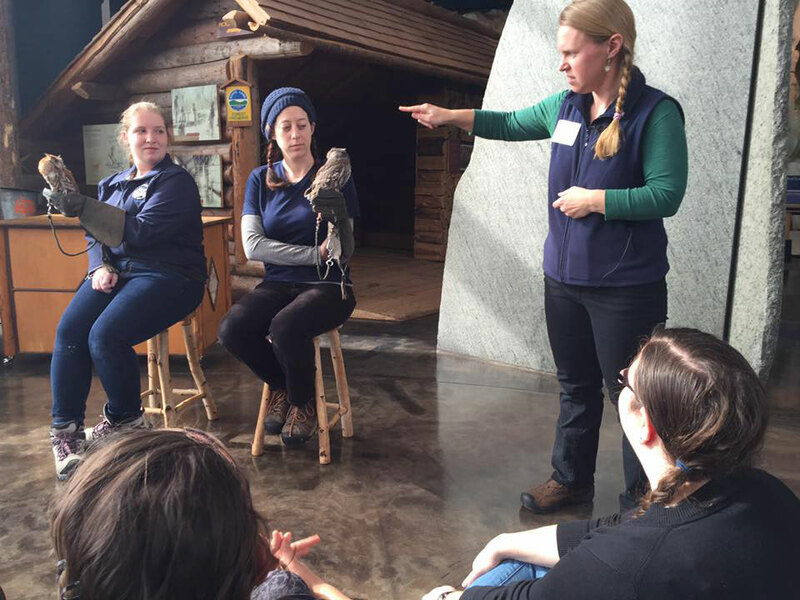 In partnership with the Wild Center (Tupper Lake, NY), VTS is creating workshops and toolkit for science museum educators and classroom teacher to improve students' ability to observe, think, listen and communicate, within the science context. Regional partners include the Seattle Aquarium, the Rochester Museum and Science Center and the Worcester EcoTarium along with teachers and administrators from local school districts. This three-year project, funded by the Institute of Museum and Library Services (IMLS), builds upon a separate 2012 planning IMLS grant where initial teaching and evaluation techniques were developed. Sharing these tools with museums and science centers around the country can allow their connections with local schools to grow and fill a vital need for education that is interdisciplinary, integrated, and focused on skills such as critical thinking, creativity, effective communication, and adaptability. Since 2013 Visual Thinking Strategies has partnered with the College of Medicine and Health at University College Cork to integrate facilitated art discussions in teaching practice. Teaching faculty from Nursing, Dentistry, Pharmacy, Medicine and Clinical Therapies are embedding VTS into established courses as a way to deepen students' skills of observation, collaboration, communication and flexibly thinking. This unique and successful partnership represents the first of its kind – a medical college to integrate VTS as a core teaching pedagogy across all disciplines. Strategies for Technology Enhanced Learning and Literacy through Art (STELLAR) is a collaborative professional development initiative involving five high-poverty, rural school districts in Lane County, Oregon, the Jordan Schnitzer Museum of Art (JSMA), the Lane Education Service District, the Oregon Writing Project, the University of Oregon's Center for Advanced Technology in Education and VTS. proficiency related to national standards in visual arts (NAEA), writing informational text (CCSS), and use of technology (ISTE).